Limited edition double-LP, foldout cover, two different colours vinyl (colours tba). 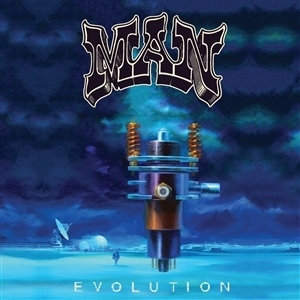 MAN - Many Are Called, Live at Keystone, Berkeley recorded 9th Aug., 1976 and featuring John Cipollina. Limited edition double LP, foldout cover, 2 different colours vinyl (colours tba). MAN - 'Many Are Called', recorded live at Keystone, Berkeley on 9th Aug., 1976 and featuring John Cipollina. Originally released in 1975, "Maximum Darkness" was the final album by Welsh rock legends, MAN for United Artists records. Recorded live in 1975 at the Roundhouse as part of a UK tour, MAN were at the top of their game on stage. For this concert they were joined by John Cippolina from San Francisco's legendary QUICKSILVER MESSENGER SERVICE. A triumphant concert, the album has become legendary return to the USA early the following year. Reanimated Memories is a collection of 11 crafted songs that clearly draw inspiration from Mans past whilst also looking forward in creative terms. "Reanimated Memories successfully covers every facet of Mans musical character, from Phil Ryans extended piece In Time, to the reflective "God Delusion by Josh Ace, to the albums closing track All the Birds written by Martin Ace. Mans first studio album after a five year hiatus, "Reanimated Memories a fine new addition to the recorded legacy of MAN. Man's classic 1974 album !! several bonustracks !! Originally released in 1974, "Slow Motion" was another classic album in the catalogue of Welsh rock legends, MAN. Touring extensively to support the record, MAN delivered a stunning series of concerts and made a triumphant return to the USA early the following year.Originally released in 1974, "Slow Motion" was another classic album in the catalogue of Welsh rock legends, MAN. Touring extensively to support the record, MAN delivered a stunning series of concerts and made a triumphant return to the USA early the following year.